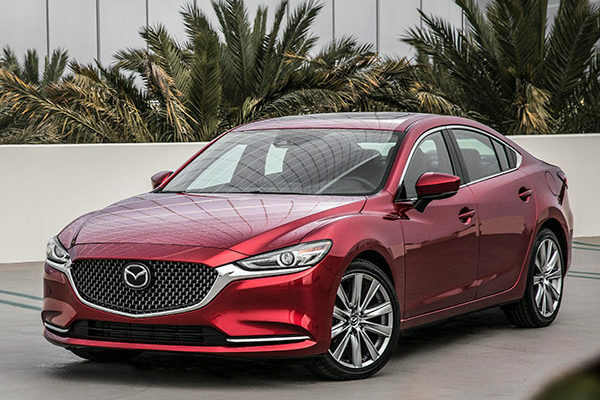 The front-wheel-drive Mazda 6 competes in a heavyweight field of midsize sedans, including the Honda Accord, Toyota Camry and Ford Fusion. Sleek and evocative, it’s the most eye-catching among them, while bringing the best roadside manners. It was last redesigned for 2013, refreshed for 2016, infotainment-updated in 2017, and now, for 2018, gets a powerful new engine. The new optional engine is a 2.5-liter turbocharged four cylinder making 250 horsepower on Premium gasoline (227 hp on Regular) and an awesome 310-pound feet of torque. The smooth engine comes out of the full-sized Mazda CX-9 crossover, where it carries 500 more pounds with no sweat, so it should make the Mazda 6 zoom. Along with the engine will come suspension upgrades, a steering rack mounted directly to the chassis for sharper steering, and stiffer body construction to reduce NVH (noise, vibration and harshness). We haven’t had a chance to test one yet. The standard engine is a normally aspirated 2.5-liter four cylinder making a modest but still frisky 187 horsepower and 186 pound-feet of torque. It’s built with Mazda’s SkyActiv technology, including direct injection, variable valve control, and a very high 14:1 compression ratio (in pursuit of fuel mileage). Both engines get a six-speed automatic transmission, while the base engine also has a six-speed manual available. With the automatic transmission and base engine, the Mazda6 gets 26/38 mpg City/Highway, or an EPA-estimated 31 miles per gallon Combined. With the optional stop/start and a regenerative-energy system called i-eLoop, it can get up to 40 mpg Highway. With the available automatic emergency braking, the Mazda6 is rated a Top Safety Pick+ by the IIHS. In the rollover test, NHTSA gives it a 4. Three models are available: Mazda6 Sport, Mazda6 Touring, and Mazda6 Grand Touring. Sport comes with cloth upholstery and includes all the usual airbags and stability control, and a rearview camera. The Touring adds blind-spot monitors, rear cross-traffic alerts, and forward-collision warnings with automatic emergency braking. Grand Touring adds LED headlamps with automatic high beams, adaptive cruise control, and automatic emergency braking that functions at a higher speed. The Mazda6 is lean from every angle, with sinewy lines that are almost Italian. It has muscular front fenders and an arched coupe-like roofline. In its class, only the Ford Fusion gets as much attention. The grille boasts the same winged design as Mazda crossovers, while the tail is finely detailed. The trim quality is high and the sculpting tasteful. The sweeping dash is crowned by a bright seven-inch infotainment display screen that was new in 2017, along with a color TFT screen replacing previous monochromatic gauges. The standard Mazda Connect infotainment is quick enough, but its control device is balky and the mapping isn’t as good as that on some of its rivals. There’s impressive interior space, with good leg room and knee room even in the rear, although the roofline does cut into rear passenger headroom. The split rear seats fold forward for more room, and the trunk has an average 14.8 cubic feet but a wide load opening. The seats remain excellent, whether upholstered in cloth, leatherette, standard leather, or the Nappa leather that’s on the Grand Touring, with heated rear seating available in a Premium package that upgrades the Nappa leather. We’re looking forward to driving the 2018 with the new engine and better NVH that might make it as quiet inside as a luxury car. Visibility is good, thanks to narrow roof pillars, possible with Mazda’s high-strength steel. The base SkyActiv 2.5-liter four-cylinder is smooth, and quick enough for most buyers; with a curb weight of about 3200 pounds, the Mazda6 is light for a midsize sedan, which takes a load off the engine. It’s a small joy with the 6-speed manual transmission, which comes with the Sport model and is available on the Touring. The engine is happiest when it’s being revved. It’s more than competitive against the four-cylinders in its class. Mazdas are known for their good balance and handling, and the Mazda 6 enhances that reputation with its standard G-Vectoring Control system of computer-controlled braking to separate front wheels in corners, bringing increased composure by shifting the weight distribution to where the grip needs it. Mazda says the deceleration force is just 0.01 g or less, so it’s undetectable, but it makes a difference to the dynamics. The turn-in is more secure. If a plush ride is a priority in your midsize sedan, the Mazda 6 might not be for you. The ride is firm and sporty on the standard 17-inch alloy wheels, and firmer with the 19s on the Touring and Grand Touring models. The steering is direct and communicative. It comes alive on a curvy road. There are clear bloodlines to the brilliant Mazda Miata. Not one thing for us not to like in a midsize sedan: elegant styling, a roomy cabin with good materials, superior handling, and now for 2018 an available engine fully worthy of the rest of the car. That’s us. The instrumentation and infotainment, and firm ride, might give pause to some.